You need an expert when it comes to tennis court cleaning, and we can deliver the service and quality you expect. Sand filled synthetic grass – Sun & Maintenance is the key. In Sydney it would be safe to say approximately 8 out of 10 tennis courts are built using this type of surface and are easily the most popular. Beautiful when maintained these sand filled surfaces can quickly become choked with dying leaf matter reducing drainage and promoting the growth of moss. If your tennis court becomes unloved and covered in moss fear not because Power Wash Australia use a specially designed synthetic turf rotary cleaner to break through the tuff moss crust opening up the infill and completely dislodging the contaminants without damaging the fibre ends of the surface. Power Wash Australia also utilizes a chemical treatment that has been specially formulated for synthetic surfaces that completely kills any remaining spoors at a microscopic level while uniquely cleaning and filtering the sand simultaneously. Once dry the court is then power swept to rejuvenate the fibre ends and if needed new sand is then added. Your tennis court now looks like new. A very hard wearing surface that’s practical considering our sometimes harsh Aussie climate. Susceptible to retaining moisture these surfaces provide the perfect environment for the build-up of dirt and algae causing the surface to become very slippery. 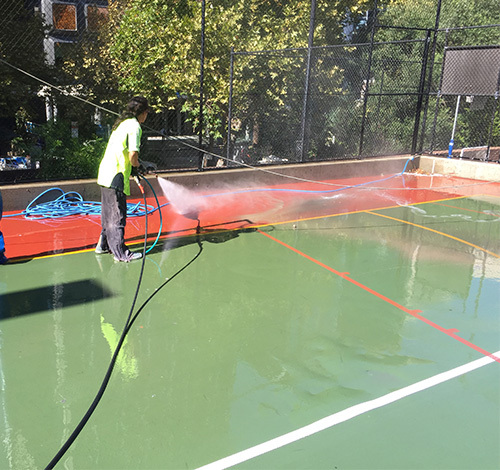 Power wash Australia can chemically treat and clean any hard court surface without damaging the surface making it look like new again. Call us today on 0415 972 645 or get an online quote for quality tennis court cleaning in Sydney. Ask us about our maintenance programme.